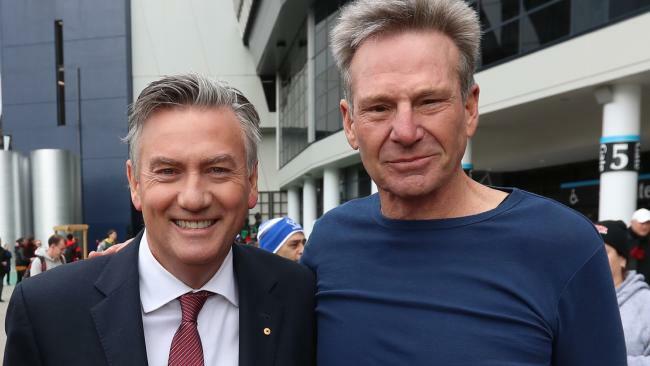 SAM Newman says he will consider joining Footy Show colleague Eddie McGuire in legally pursuing an alleged scam organisation. Newman took a moment to get serious after he was first introduced on Thursday night's show to address an accused social media sham that has used photos of himself in an erectile dysfunction treatment campaign. Newman made it clear the images of him in a hoax online news article, posted on social media, were completely fake. The scam is similar to the one that engulfed Footy Show host Eddie McGuire earlier this year. A web page, mocked up to resemble an article in GQ magazine, emerged on social media featuring McGuire pushing a product called "TryVexan" - allegedly a similar product to Viagra. 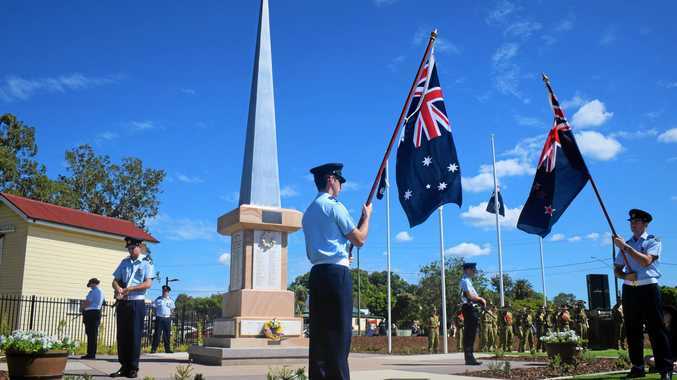 McGuire dismissed the article in April as total fiction and also outlined his intent to take legal action against the individuals responsible. "We're going to go after Facebook and the people who have perpetrated this lie and embarrassed me," McGuire said at the time. Newman revealed on Thursday he would also consider legal action - but admitted the alleged scammers could be difficult to nail overseas. Sam Newman on The Footy Show. "I've had hundreds of inquiries about penile dysfunction, erection problems, and how to get a hard-on," Newman said on the iconic Channel 9 show. "I have been used as you have as being the CEO of some sick company. "Could I say, it's an absolute sham. It's actionable. It's bogus. If you think I'm part of that, I'm not. Having said that, if you're having trouble at home in that department I'm happy to come around and have a look at your work. Man, woman, or beast, give us a call. "Well of course we would think of taking (legal) action. "The whole thing is bogus and if we can find someone to sue we will." McGuire responded to Newman's situation by lightheartedly suggesting the pair could combine their legal resources to launch a class-action lawsuit against the American authors behind the alleged scam. "I went through something similar this year. Not just me, but numerous other Nine identities and other TV personalities in general have got done on this," McGuire said. "Mine was on Facebook, yours I saw today was on The Age online. Now surely they have some sort of responsibility, as Facebook do, about what goes up. "We'll I've tracked them down partly, Sam. It's a registered company based out of New York and there's a little bit more to it. It's very hard to actually find the people. But the publisher is still liable." 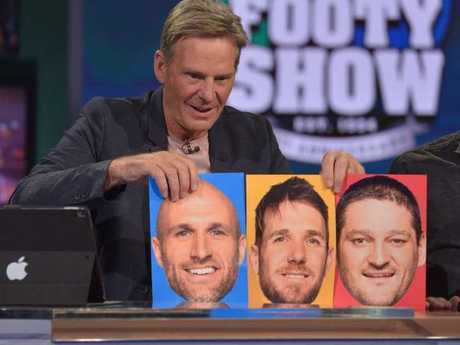 The Footy Show duo will consider their legal options. 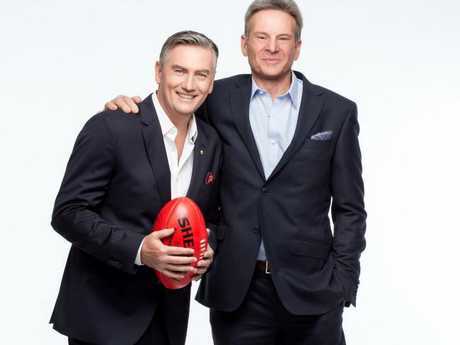 Meanwhile, McGuire has taken a cheeky parting shot at Footy Show colleague Damian Barrett just one week after senior footy reporter Caroline Wilson predicted her fellow journalist would leave the show at the end of this season. She has also predicted Newman would not be offered a contract on the Footy Show for 2019. Newman addressed the rumours on Thursday night. "The Footy Show may well quit me, but I am not quitting The Footy Show," he said. "I don't have any control or say on what the network wants to do with The Footy Show. I assume it is going ahead and if it is going ahead I would make no assumption that I would be on it. "I have been on it for 25 years. That might continue. It may not continue. It is completely out of my hands." Reports of Barrett's uncertain future at the show followed reports the journalist had a heated stand-off with McGuire during a production meeting before a filming of the show two weeks ago. McGuire poked fun of the reports on Thursday, making jokes about reports he and Barrett argued over the reporting of ASADA's investigation into Collingwood star Sam Murray recording a positive test for an illicit substance, reported to be cocaine. The Collingwood president even appeared to give Barrett a farewell serve at the end of his segment. "Great stuff, Damian, well done mate, and we wish you well in the future," he said.